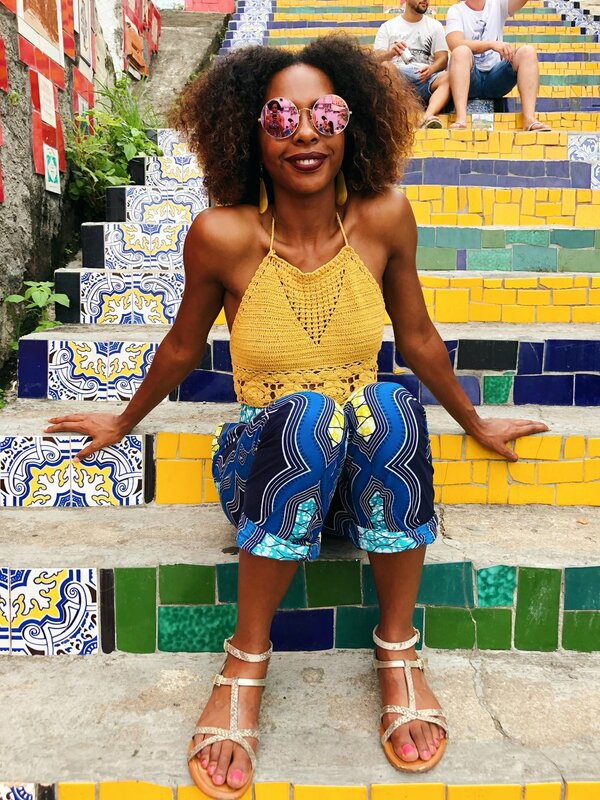 When I think of Brazil, I think about all the things I was craving during my winter escape: the bright sun, warm weather, and beautiful beaches. During my trip planning phase I learned Rio's summer weather is often hot, humid and "a little rainy". In my optimistic head "a little rainy", meant some showers at night when I'm in the comfort of a hotel bed or quick rain showers during the day that doesn't disrupt any activities. Well, of course Mother Nature doesn't operate on convenience. The majority of our time in Rio was extremely cloudy and rainy. While it wasn't my ideal vacation weather, we made the best of it and lived it up! Portuguese is the official language of Brazil. I found that beyond Portuguese most people felt more comfortable speaking Spanish before English. Phenesse speaks Portuguese and Spanish conversationally which was incredibly useful when navigating the city. I would recommend learning some key phrases in Portuguese to have a more fruitful trip. One of the most helpful comments about safety in Rio came from one of our Uber drivers, Leonardo. He said Rio has a reputation for crime and they have earned it for a reason. However, you shouldn't let this fear stop you from enjoying the city. Most crimes are crimes of opportunity, so just be smart and alert. When in doubt about the safety of a particular area, ask the locals. They will be honest and give you pointers. Overall, I felt safe in Rio. There were a lot of police officers and security guards throughout the touristy areas. One key safety measure I always use when traveling is to keep my cross-body bag towards the front of my body and keep the flap facing me. While in Rio we had an enjoyable time at the Slaviero Lifestyle Hotel. The staff were extremely helpful and friendly, the rooms were comfortable, and the complimentary breakfast was delicious! The Slaviero hotel is located in the Lapa neighborhood of Rio. We really enjoyed Lapa's local feel and it was a short walking distance from key landmarks. I will say, most tourists choose to stay in the Copacabana area, which is minutes away from the beach. Whereas, Lapa is a little more grungy than Copacabana, but we didn't mind. Food and drinks are more affordable in Lapa than Copacabana. You can get a Caipirinha from a street cart in Lapa for 5 Brazilian Real (BRL)/ 1.56 USD, but this will cost you 22 BRL/ 6.88 USD in a restaurant in Copacabana. Rio has extensive public transportation options that includes city buses and a metro system. We traveled throughout Rio exclusively on Uber or by walking. Uber is extremely affordable in Rio, including the availability of Uber Pool. The majority of our rides averaged around $5. I have the Sprint Global Roaming plan that allows me to have unlimited data and text messaging while traveling abroad. This was really helpful for ordering Ubers. However, if you don't have a global data plan I would recommend purchasing a sim card upon arrival. There are also a few free wifi networks planted throughout the city that covers the edge of the Zona Sul of Rio, Copacabana, Leme, Leblon and Ipanema beaches, and part of downtown, from Cinelandia to Presidente Vargas Ave.
"Beautiful, I just want you to know you're my favorite girl..." If you are familiar with Pharell and Snoop Dogg's hit Beautiful, you probably instantly recognized the colonial-style mansion of Parque Lage. The park graciously sits at the foot of the Corcovado Mountain. The mansion of Parque Lage was remodeled into an art school and a courtyard cafe. 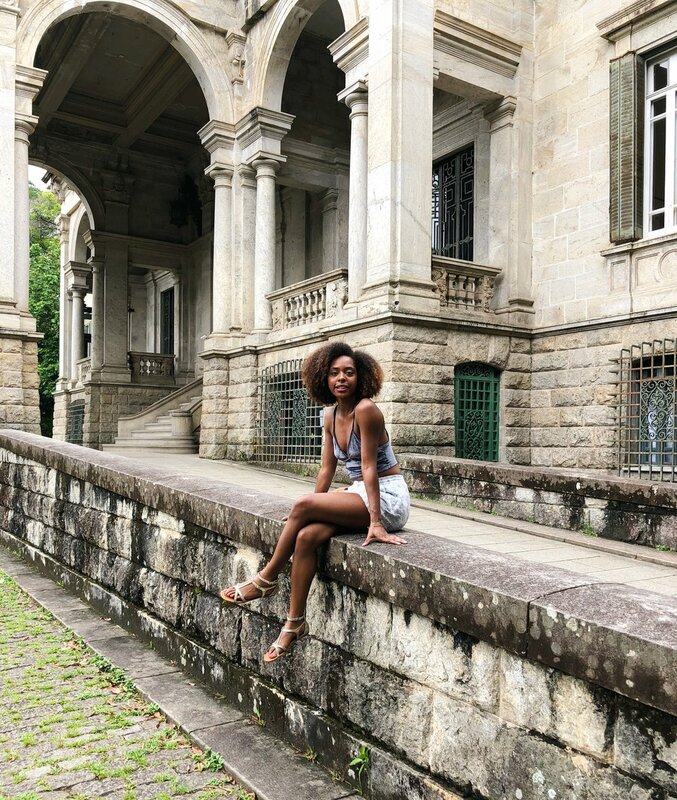 Beyond pretending to be an extra in the Beautiful video, my favorite experience at Parque Lage was walking along the lush tropical vegetation trails that surround the mansion. Pro-tip: Despite being a bit far from other tourist attractions, people are starting to catch on to this gem. Plan to arrive early to avoid huge crowds of people trying to take pictures in the courtyard. These iconic steps, also featured in the Beautiful video, were created by Chilean painter and sculptor, Selarón. There are 256 colorful steps decorated with over 2000 tiles collected from over 60 countries around the world. Pro-Tip: As you can imagine, these stairs are extremely popular and the area gets really crowded. During my visit, there was a tourist-managed line to take pictures in the center of the steps. Even with this system, it was virtually impossible to get a clear shot. Also, I've witnessed a few curse-out sessions from people asking other people to move out of their picture. To avoid large crowds and photo- turf wars, try to arrive early morning or late evening. Me sipping my Caipirihna minding my business while enjoying a tourist-free photoshoot in the evening! The Selarón steps leads to the artsy hilltop district, Santa Teresa. We visited Santa Teresa in hopes of stopping by the Parque das Ruinas, a small park that has a ruined mansion home, but it was closed for the new year holiday. Walking to Santa Teresa was a calf workout (the steep sloped cobble-stone roads are no joke) with a charming view. The neighborhood is a great place to sample traditional dishes from across Brazil. The cog train to Christ the Redeemer departs from Corcovado Station every 30 minutes between 8am and 8pm. The train was originally used to transport parts of the statue. It is a 20-minute scenic ride to the top of Corcovado Mountain through the world’s largest urban forest, Tijuca National Park. Because of the incredible scenery this is the preferred transportation choice for many travelers. Tickets are R$ 62 (19.40 USD) during low season and R$ 75 (23.47 USD) during high season. Tickets can be purchased at Corcovado Station, via the Corcovado Train website or at official kiosks in the nearby Laranjeiras district. We went online and booked seats on a van with Paineiras-Corcovado. They depart from multiple locations throughout Rio from 8am to 4pm. The van took us up most of the way up the mountain, and from there we took an official van of Tijuca National Park right to the top. The cost of the transportation-admission combo is roughly the same as the train, but does not have long waiting times. Another option is to drive most of the way to the summit and then catch the official van for R$18 (5.63 USD). You can purchase these tickets from Largo do Machado subway station or online. Pro-tip: If you are traveling during rainy season make sure to check the visibility of the statue here before booking your tickets. There are several hiking trails that go through Tijuca National Park and lead up to the statue. The primary trail begins in the gorgeous Parque Lage and continues through Tijuca for two hours, following the rails of the Corcovado Tramway for the last half hour. Rainy & cloudy weather isn't my go-to beach weather, but that didn't stop a lot of people from indulging in a dip in the infamous Copacabana beach. We instead opted for a nice stroll and people watching along the boardwalk. Sugar Loaf Mountain was the first iconic site we visited in Rio. We initially went to catch a colorful "welcome to Rio" sunset, but the clouds weren't having it. Nonetheless, it was still a cool experience. Taking the cable car into a cloudy Sugarloaf Mountain was like being transported into a Twilight Zone. The ride was divided into two stages. The first stage goes from Praia Vermelha (Red Beach) to Morro da Urca (Urca Hill). The second stage goes from Morro da Urca to Sugarloaf Mountain. At the top of Sugarloaf Mountain we enjoyed a mesmerizing panoramic view of Rio's beaches, mountains, and forests. We made the best of our rainy days by shopping and eating. 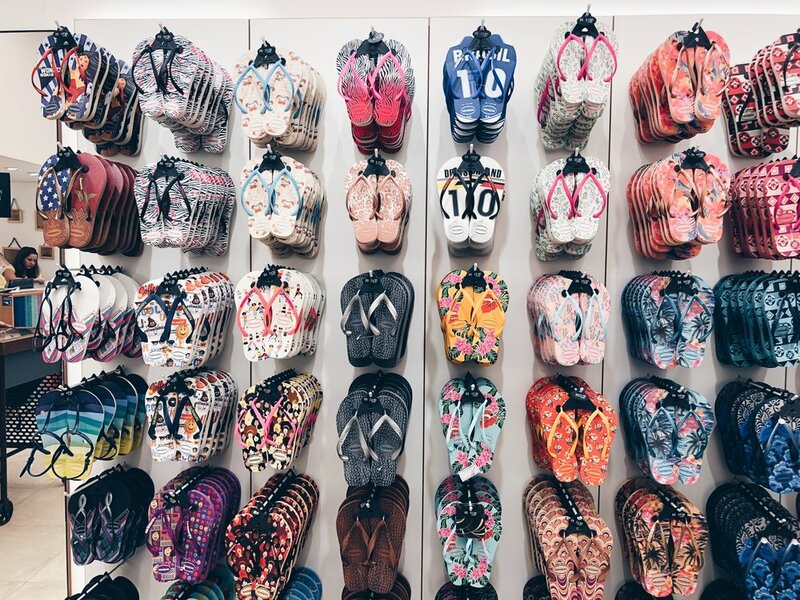 I couldn't leave Rio without getting a pair of Havianas, Brazil's original flip flop. Confeitaria Colombo is a stunning 120 year old cafe in the heart of Rio. It's a cultural gem that attracts many visitors. It was extremely crowded when we visited, but since it was raining we didn't mind standing in line for 20ish minutes to be seated. The alternative was to order at the cashier and wait for some standing dining space to open up. The pastries were really tasty and besides the long wait the service was quick (once we sat down). It's become a tradition of mine to take a hike during my trips. Hiking the Trilha do Morro Dois Irmãos was the perfect way to enjoy a view of Rio without a large crowd. 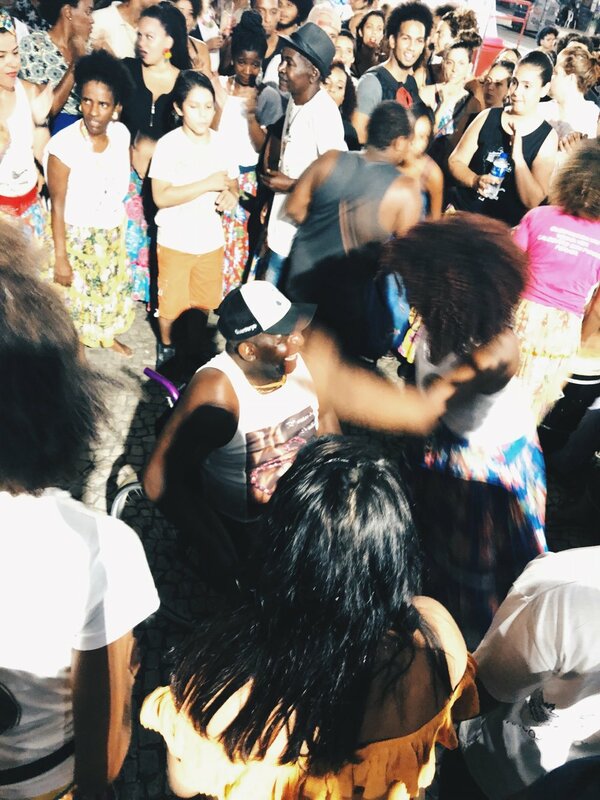 Besides celebrating NYE in Copacabana, we spent most of our nights turning up in Lapa. There was so much happening in this neighborhood! We actually never went inside a venue to party because there were always huge crowds on the streets dancing. The energy was unforgettable! Despite the weather, I was still captivated by Rio's beauty and charm. 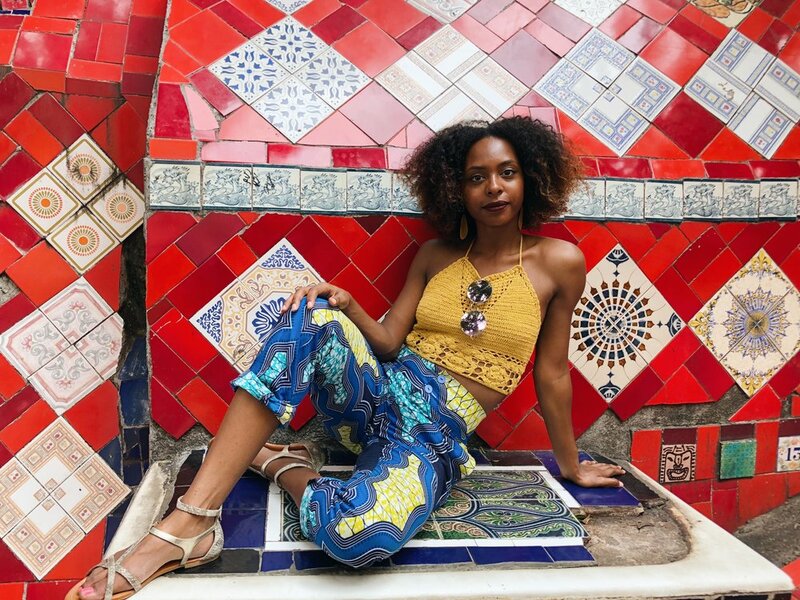 My time in Rio was everything I imagined and more! Have you been to Rio? What were some of the highlights of your visit?